The author of the book driving passionate discussion across America returned from a three day tour in Miami with a commendation from the mayor and inspiration from the audiences and people he encountered while presenting his solutions for the country’s distress. John Horvat II, author of Return to Order and vice president of The Society for the Defense of Tradition, Family and Property based in Hanover, Pennsylvania, also visited Coral Gables, Florida recently. He conferred with numerous groups, was interviewed by a leading Hispanic talk show host and met with the Mayor of one of the country’s largest urban areas. During the two-day visit, Horvat joined conservative Cuban talk show host Lourdes d’Kendall on her popular program “En mi Opinión” which is broadcast on Univision’s Radio Mambi’s WAQI 710 AM. They discussed current socio-economic trends that are positioning the nation on the threshold of calamity and Horvat’s solutions to bring balance through a return to faith and family. During his visit to Coral Gables, Horvat attended a book signing appearance at Barnes and Noble and presented his much acclaimed presentation “Honor Thy Father and Thy Mother: The Key to Bringing America Back to Order,” to an audience that included doctors, retired political leaders and students. “Mr. Horvat brought to light the decline of the moral values in today’s society in the treatment towards parents and elders. It seems respect and consideration for parents, grand-parents and others is unfortunately now considered “cliché” by many. His talk made us realize that not everything is lost and with the help of God and our own effort and determination, our nation can indeed return to order,” said Ralph and Cristina Hughes, a Miami couple attending the speech. 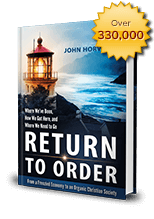 Return to Order: From a Frenzied Economy to an Organic Christian Society —Where We’ve Been, How We Got Here, and Where We Need to Go ranked #1 on Amazon/Kindle in four countries in December and has sold 25,000 copies. It has received dozens of endorsements from scholars, clergy, politicians and other leading American and European figures. Horvat will be leading discussions in more than two-dozen cities during 2014. 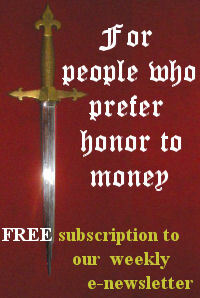 For information call 885-861-8420 or visit www.ReturnToOrder.org. This entry was posted in Featured and tagged America, beautiful, Family, frenetic intemperance, Return to Order by John Horvat II. Bookmark the permalink.